Margot Robbie amps up the promotion of ‘Mary Queen Of Scots’ with three looks yesterday (December 3) in New York City. 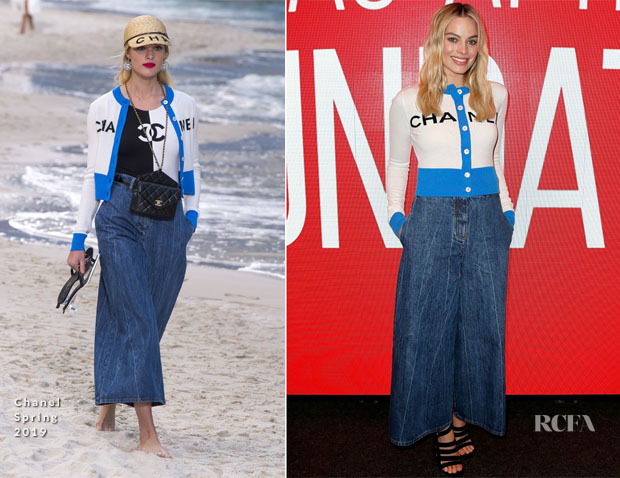 SAG-AFTRA Foundation Conversations: ‘Mary Queen Of Scots’: As we all know logomania was a big thing this year, and Margot was serving up old-school vibes in a retro-inspired Chanel Spring 2019 cardigan, styled with a pair of high-waist baggy ‘mum’ jeans with permanent crease marks. Black Alumnae strappy sandals completed her seamlessly pulled together day time outfit. The Tonight Show Starring Jimmy Fallon: I’m sure this dress needs no introduction. It’s Brock Collection of course. The giveaway is the sweet floral embroidery and the airy pouf sleeves that fall to an off-the-shoulder neckline. You disliked her first ever Brock Collection look, so how does this one fare? Jimmy Fallon Departure: The actress did a quick change out of her Brock Collection dress to a white look from Self-Portrait’s Spring 2019 collection, featuring a minimal silhouette with flattering details such as the twisted neckline and sensual keyhole cut-out . Stuart Weitzman black suede ‘Eloise’ boots complete her look.